Marton Market Day is the Rangitikei’s largest event and the most vibrant day in the districts calendar. Market Day takes over the town with over 200 stalls and entertainment all day long. Marton Market Day is the very best place for all your Christmas shopping with something on offer to suit everyone. A huge varoty of stalls including garden art, quality children’s toys and clothes, furniture, jewellery, pottery, food, plants make up, body products and even the pets are catered for. Entertainment will have you laughing, singing and tapping your toes. Be sure to put it in your calendar so you don't forget to join us. Come along, bring your friends and family and make a day of it. 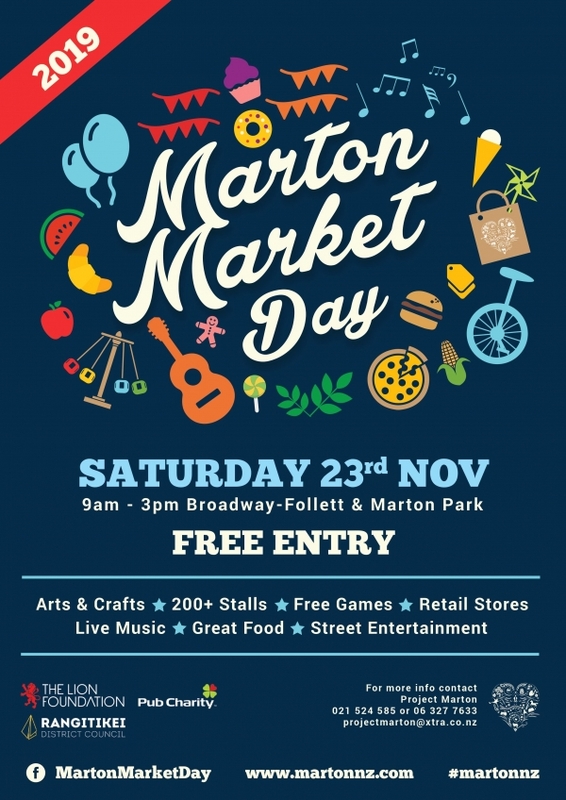 Looking forward to having you join us in Marton. To secure your space - Complete the form below and pay your site fee. A limited number of Powered Sites are available for Food Stalls only and incur an additional $20 fee. Are your products made locally? Yes No Please state your stall dimensions. By Signing you agree to the terms and conditions Registrations will not be accepted without agreeing to the terms.